Reference past PCIT presentations from our Annual PCIT Conferences, and more! Thanks for another wonderful conference! You can view photos and videos from the 2018 conference on our Facebook page, @UCDPCIT. *If you are a presenter and do not see your presentation linked here, it means we do not have it. Please email a PowerPoint or PDF file of your presentation or poster to AubJohnson@ucdavis.edu and it will be added. 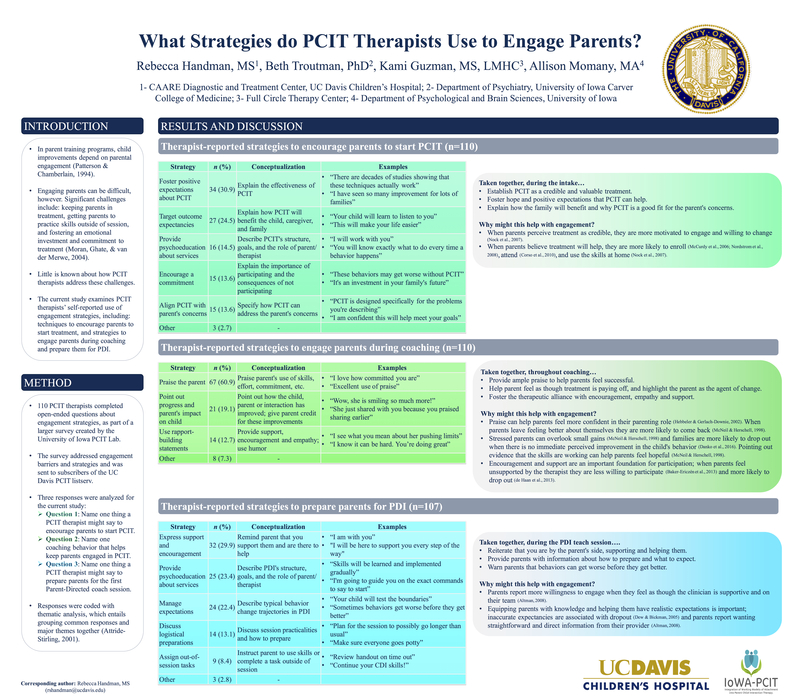 What strategies do PCIT therapists use to engage parents? Troutman, B. – Does teaching parents to give time-outs hurt their attachment relationships with their children? Workshop 5: Shinn, M., Blacker, D. & Timmer, S. – Trainer Toolbox: Introducing the ToT Competency Checklist!